"Emirates Air Line" redirects here. For for the airline, see Emirates (airline). On 4 July 2010, Transport for London (TfL) announced plans to develop a cable car crossing over the River Thames. It is the first urban cable car in the United Kingdom. Designed by Wilkinson Eyre Architects, Expedition Engineering and Buro Happold, it crosses the river at a height up to 90 metres (300 ft), higher than that of the nearby O2 Arena. The cable car provides a crossing every 15 seconds, with a maximum capacity of 2,500 passengers per hour in each direction, about 50 busloads. Bicycles may be carried. Passengers can pay for their journeys with pay-as-you-go Oyster cards. A planning application was submitted to the London Borough of Newham in October 2010 for the "erection of a cable car for the length of 1,100 metres (3,600 ft) over the River Thames from North Greenwich Peninsula to Royal Victoria Dock at a minimum clearance of 54.1 metres (177 ft) above mean high water springs". The application listed the structures planned for the service on the north side of the Thames as an 87-metre (285 ft) north main tower at Clyde Wharf, a 66-metre (217 ft) north intermediate tower south of the Docklands Light Railway tracks roughly midway between Canning Town and West Silvertown stations, a two-storey gondola station and "boat impact protection" in Royal Victoria Dock. South of the river there is a 60-metre (200 ft) main support tower and a boarding station within the O2 Arena car park. In January 2011, News International was planning to sponsor the project, but withdrew its offer. In October 2011 it was announced that the Dubai-based airline Emirates would provide £36 million in a 10-year sponsorship deal which included branding of the cable car service with the airline's name. Construction began in August 2011 with Mace as the lead contractor. Mace built the cable car for £45 million and was to operate it for the first three years for a further £5.5 million. TfL stated that the initial construction funding and Emirates sponsorship would cover £36 million of the cost, with the rest to be funded from fares. In 2011 the cable car was the most expensive cable system ever built. In May 2012, TfL said that the cable car would be running by the summer of 2012, and that while there were no plans to have it open before the 2012 Olympic Games, there would be plans in place in case it was opened in time. The public opening took place at noon on 28 June 2012. 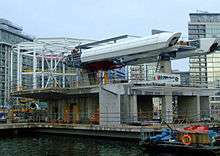 TfL reported that the total cost of the project was about £60 million, of which £45 million went towards construction. It estimates that the service can carry 2,500 people per hour. There are 36 passenger gondolas, of which 34 are in use at any one time, with a maximum capacity of 10 passengers each. 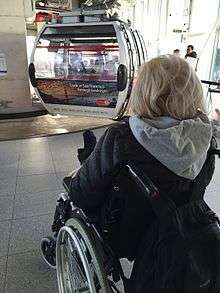 All passenger gondolas are ready for disabled persons using wheelchairs, including those ones with leg rest extensions. There are also two (open) engineers' gondolas for use by maintenance staff. The Emirates Air Line route was introduced onto the London Tube map in June 2012. It is the first to have the sponsoring company's logo shown on the map. Similar to the representation of the Docklands Light Railway, the cable car route is displayed as a triple red stripe rather than a solid line, to distinguish it from London Underground lines. The service's logo is a red cartouche containing the Emirates logo and the TfL roundel, to reflect the corporate sponsorship by the airline. As with the marketing of the London Eye, the transit of the cable car is referred to as a "flight" and marketing literature borrows language from the airline industry, such as referring to tickets as "boarding passes". As of 2016, the fares are £4.50 for a single journey, or £3.50 when paid with a pay-as-you-go Oyster card, or on presentation of a valid non-PAYG Oyster or Travelcard (the cable car is not fully integrated into TfL's ticketing system). To encourage use of the service for commuting, further discounts are offered with a "frequent flyer" ticket which allows 10 journeys within a 12-month period. The London Assembly and the Liberal Democrats have called for full fare integration. The eastern end of the cable car line (51°30′28″N 0°01′04″E﻿ / ﻿51.5077°N 0.0178°E﻿ / 51.5077; 0.0178﻿ (Emirates Air Line (Royal Docks terminus))) is at the Royal Docks, home to the ExCeL Centre, which hosted a number of martial arts, boxing, table tennis and weightlifting events during the 2012 London Olympics. The closest interchange to the Docklands Light Railway is at Royal Victoria station. In the second week of October 2012 about 42,500 journeys were made. Journeys made fell to 23,000 for the same week in 2013. In November 2012, after the Olympics, passenger numbers dropped to less than 10% of capacity. Fewer than 0.01% of journeys were made on discounted commuter fares which were 10 for £16. As of 9 February 2013 there had been 1,815,212 passenger journeys since opening. The average passenger journeys for the period between 16 September 2012 and 9 February 2013 has been a mean of 31,601 a week and a median of 30,667. The highest usage during that period was an outlier of 70,704 for the week ending 3 November 2012, and the lowest usage was 14,755 for the week ending 2 February 2013. From 29 August 2015 to 20 August 2016 an average of 28,400 weekly journeys were made, with a standard deviation of 11,000; more journeys were made in the warmer months. There were only four Oyster card users qualifying for a discount available to people making more than five journeys a week. Critics of the cable car have dismissed it as an impractical transport solution, which will appeal to tourists at peak times but is unlikely to attract a large number of cross-river locals or commuters due to its location and the cost of tickets. It was similarly labelled a 'white elephant'. There has also been criticism of the project's £24 million-plus cost to taxpayers, caused by a budget overrun. Boris Johnson, the former Mayor of London, had said the cost of the scheme would not be underwritten by taxpayers. The cable car's location has also caused controversy, with advocates of walking and cycling favouring a Sustrans-sponsored plan for a walking and cycling bridge east of Tower Bridge between Rotherhithe and Canary Wharf. The scheme was also criticised because the original contract forbade the use of funds from Israel, which the UAE does not recognise diplomatically. It imposed restrictions on "(i) any Competitor; or (ii) any person who is a national of, or who is registered, incorporated, established or whose principal place of business is in a country with which the United Arab Emirates does not at the date of this Contract or at any relevant point during the Term maintain diplomatic relations." The contract also forbade the mayor or Transport for London from criticising the United Arab Emirates royal families, the UAE government, or the contract. The clause regarding Israel was later removed. ↑ Transport for London. "Emirates Air Line performance data". Transport for London. Retrieved 27 February 2016. ↑ Booth, Robert (28 June 2012). "London cable car offers investor's-eye view of the Thames". The Guardian. London. Retrieved 17 November 2012. 1 2 3 "Emirates sponsors Thames cable car". BBC News. 7 October 2011. Retrieved 7 October 2011. 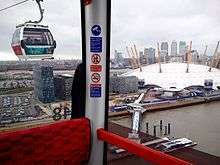 ↑ "Thames cable car linking O2 arena and Excel approved". BBC News. 18 March 2011. Retrieved 18 March 2011. ↑ "London's new cable car tested ahead of summer opening". BBC News. 15 May 2012. Retrieved 15 May 2012. ↑ "Thames cable car opens for passengers on 28 June". BBC News. 18 June 2012. Retrieved 18 June 2012. 1 2 "Thames cable car opens for passengers". BBC News. 28 June 2012. Retrieved 28 June 2012. ↑ "Local attractions". www.emiratesairline.co.uk. Retrieved 6 June 2015. ↑ "Pillars have been built for Thames cable car project to connect Greenwich to Newham". News Shopper.co.uk. 8 August 2011. Retrieved 7 October 2011. 1 2 Dale, Steven. "Exploring the Thames Cable Car Costs". The Gondola Project. Retrieved 8 October 2011. ↑ "Plans unveiled for a new Thames crossing with London's first cable car system". Transport for London. 4 July 2010. Retrieved 5 July 2010. 1 2 Jones, Sam (4 July 2010). "Thames cable car plan to link Olympic venues in time for 2012 games". The Guardian. London. Retrieved 5 July 2010. 1 2 "Planning Application Details (10/02311/FUL)". London Borough of Newham. 29 October 2010. Retrieved 3 November 2010. ↑ Edwards, Tom (23 September 2011). "Thames cable car costs rise again to £60m". BBC News. Retrieved 8 October 2011. ↑ "Commissioner Johannes Hahn - Major projects". Ec.europa.eu. Retrieved 26 March 2013. ↑ Leigh, David; Hill, Dave (2 May 2012). "News International's offers to Boris Johnson revealed in Leveson evidence". The Guardian. London. ↑ "Thames cable car could be on course for Olympics". Wharf.co.uk. 10 August 2011. Retrieved 8 October 2011. ↑ "London's new cable car tested ahead of summer opening". BBC News. 15 May 2012. Retrieved 16 May 2012. ↑ "Emirates Air Line". Emirates Air Line. Retrieved 19 June 2012. ↑ "Thames cable car opens for passengers". BBC News. 28 June 2012. Retrieved 28 June 2012. ↑ "Emirates Air Line". Mace. Retrieved 27 August 2012. ↑ "Maps". TfL website. Transport for London. Retrieved 19 June 2012. ↑ EAL Web site: "Taking a quick flight down South? ..."
1 2 "Emirates Air Line FAQ". Emirates Air Line website. Retrieved 19 June 2012. 1 2 3 "Call to boost Thames cable car commuters". BBC News. 16 November 2012. Retrieved 17 November 2012. ↑ Hoscik, Martin (16 July 2012). "London Assembly calls for rethink on cable car fares". Mayorwatch.co.uk. Retrieved 17 November 2012. 1 2 "Boris Johnson's 'pitiful' £60m cable car used by just four regular commuters". London Evening Standard. 21 November 2013. ↑ "Emirates Air Line performance data". Transport For London. Retrieved 23 August 2016. Cumulative performance data, updated frequently, and links to customer satisfaction surveys. Figures given as of 23 August 2016 average to 28355 with SD of 10976 for the previous 52 weeks. ↑ Saul, Heather (21 November 2013). "Boris Johnson's £60m cable cars used regularly by just four commuters". The Independent. London. Retrieved 22 November 2013. ↑ Daniel Shane (22 November 2013). "$100m Emirates Air Line 'has just four regular users'". ArabianBusiness.com. Arabian Business Publishing. Retrieved 22 November 2013. ↑ Topham, Gwyn; Van Steenbergen, Marishka (19 April 2012). "FAQ". The Guardian. London. ↑ "The Emirates Air Line – London's £60m white elephant". The Guardian. London. 18 February 2013. ↑ "ThamesBridgeFeasibilityStudy.pdf" (PDF). Archived from the original (PDF) on 11 January 2012. ↑ "Boris Johnson tells TfL to rewrite 'anti-Israel' Emirates airline cable car contract". The Evening Standard. 17 July 2013. Retrieved 13 March 2015. ↑ Dysch Marcus (8 August 2013). "Cable car deal with Emirates airline amended". The Jewish Chronicle. Retrieved 13 March 2015. Wikimedia Commons has media related to Emirates Air Line (cable car).